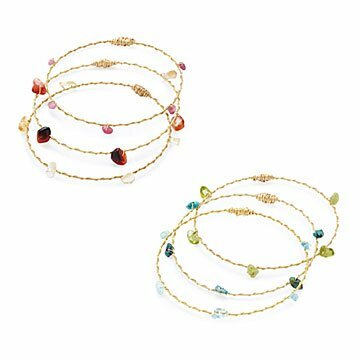 Tune up your look with these bangles made from guitar strings accented with semi-precious stones. For Ladies of the Canyon and Indigo Girls, acoustic guitars never go out of style. Tune up your look with these layering bangles made from real brass guitar strings accented with semi-precious stones. Maker Naomi Celestin's primary interest is art, but she was born into a family of New Orleans musicians. So she combined her interests and influences in her reclaimed guitar string jewelry designs. Her three-bangle sets feature the flexible feel of acoustic strings and non-tarnish gold wire with coordinated collections of stones. The blue-green set strikes a cool chord with turquoise, peridot, and apatite nuggets, while the amber-pink set strums through notes of citrine, carnelian, and tourmaline. Worn in sets or with other stacked bangles, they make stylish accents for music lovers and distinctive birthstone gifts. Handmade in New Orleans by Naomi and a small team of women artisans. Art and history are Naomi Celestin's primary passion but, as fate would have it, she was born into a family of talented New Orleans musicians. So in the NOLA spirit of innovation, she combined her interests and influences in her reclaimed guitar string jewelry designs. Armed with a Bachelors in Archaeology with a minor in metalwork, Naomi landed her first job at the Acadiana Arts Council promoting artists and musicians in her native Louisiana. During that time, she continued to create jewelry as a hobby, developing her signature style of wirework. One day, she saw some old strings lying about her uncle's house and asked if she could have them. She incorporated the castoff strings into her wirework designs and saw that she was onto a good idea. Realizing that musicians change strings often and just throw them away, she began calling on all the musicians she knew to ask them to save the strings. The idea took off, and before long, both music lovers and fashion-forward women began asking for her designs. Can be polished periodically with any jewelry polishing cloth. I have bought this product again and again and again! Looks good with casual and work outfits. Unique and simply pretty. It's a versatile, stylish set. I love that the bracelets weren't too big. They are both delicate and beautiful. You can't have too many! Great for travel! So light!